Like Radiohead’s last few releases, the actuality of Tomorrow’s Modern Boxes, Thom Yorke’s second solo album, is somewhat overshadowed by its unconventional release. Announced and dropped on the same day via BitTorrent, with only a few vague hints of a release in the preceding days, it almost seemed as if Yorke was intentionally passing off the record with as little hype as possible, burying it within the news of his main band being back in the studio. That assumption’s unfair to this record, which is much better than a tossed-off collection of experiments, but it also highlights Tomorrow’s Modern Boxes as an unquestionably minor statement. The Eraser, his debut solo record, preceded this record by eight years, and that’s an album of similarly small-scale gems, a deliberate breather from the hullabaloo that surrounds a new Radiohead release. What’s exemplary about The Eraser is how it had emotional directness on its side, with Yorke’s imagery and delivery more intimate and forthright and, in the case of the terrified, urgent “Harrowdown Hill,” explicitly political. Boxes, conversely, eludes that sort of easy analysis. It certainly sounds like a Thom Yorke record: the dour tone, the hop-skip rhythms, the layered drones and haunting (and haunted) vocals all make their way here in some form or another. Some critics (including me) considered Atoms For Peace’s record to essentially be Yorke’s follow-up to The Eraser, but Boxes really does feels more aligned with its predecessor. The difference is that Boxes showcases Yorke at his least song-oriented, which is both its greatest asset and its greatest liability. In the near-decade since The Eraser, Yorke has spent quite a lot of time in the electronic community, buddying up with Flying Lotus and Actress, calling on the likes of Four Tet and Mark Pritchard to remix Radiohead tracks, and all the while indulging his love of nimble rhythms with The King Of Limbs and Atoms For Peace. It follows, then, that he and producer/collaborator Nigel Godrich have become more versatile, confident DJs in the meantime. So confident, in fact, that Boxes plays as Yorke’s bid for credibility as a serious electronic artist. Now, of course, electronics and all manner of synthesized effects have made up a great portion of Yorke’s music for over a decade, and he’s helped to cultivate an influential, distinct style of his own (so much so that “Radiohead-esque electronica” makes its way into reviews for other artists from time to time). Yet he also hasn’t made something like the nine-and-a-half minute house-n-glitch of “There Is No Ice (For My Drink)” and “Pink Section,” which only feature his voice in chopped, intelligible snippets. (Unless I’m missing something, this is the longest stretch of any Yorke-related music to go instrumental on us.) And even on the more conventional tracks like “A Brain In A Bottle” and “Guess Again!,” he’s rarely eschewed conventional structure so readily throughout a whole record, letting it work entirely off the atmosphere. Much of it works. The music here, if not truly forward-thinking or unpredictable, is frequently attractive and well-crafted, finding a couple new wrinkles in his sound and, as always, using his voice as a counterpoint to the digital detritus that surrounds it. The piano pulse that underscores “The Mother Lode” is sleek and inventive; “Truth Ray”‘s quivering “Oh my God” refrain is surprisingly poignant, and the revelatory closer “Nose Grows Some” might be one Yorke’s most overtly gorgeous works ever. The problem lies where Tomorrow’s Modern Boxes differs from The Eraser. This album may be more eclectic and sharply produced in some ways, but while the prettiness of the arrangements surface among repeated listens, there isn’t much else here to return to. Any of the intimacy and vitality of its predecessor is replaced by something that’s simply a great mood-setter, but not much more than that. Abstract and intermittently evocative it may be, Boxes doesn’t possess the originality or depth to get by without something more substantial to grab onto, which leaves it a finely sculpted, but not entirely compelling, curiosity. 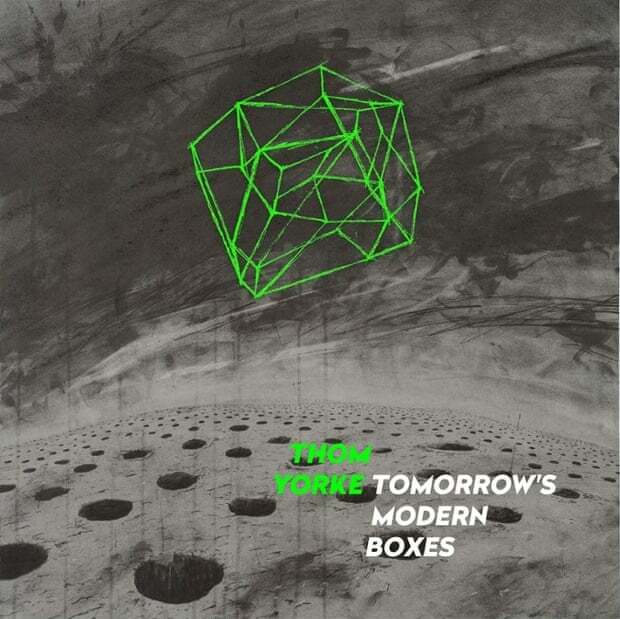 Weirdly, though not completely unsurprisingly, Tomorrow’s Modern Boxes shares a similar vibe to Damon Albarn’s first solo record, Everyday Robots, released earlier in 2014—the aching melancholy, the reliance on elliptical structure, the looping tracks. And while both records have moments as beautiful as any of each artist’s best work, they also both feel like missed opportunities, precisely because they don’t dig deep enough to stick. The Eraser was a minor classic because it placed Yorke’s voice and songwriting in a more personal context. Here, we have what amounts to a master musician showing us what he’s been up to lately, and though there’s plenty here to marvel at, it feels more like the work of a hobbyist than an artist.